Chris Matthews almost got another tingle up his leg on national television Tuesday talking about how wonderful Barack Obama is. In the opening segment of "Hardball," the host and his perilously liberal guests concluded by trying to figure out why conservatives don't like the current White House resident. In the end, and sadly predictable, the conclusion was the color of Obama's skin. CHRIS MATTHEWS, HOST: It's about being an American, and the wonderful thing about this country is you can grow up to be basically what, you know, it's a Great Gatbsy country, you can actually create your own identity and become a person. This guy Barack Obama, not to get too basic about it, did everything right. MATTHEWS: He studied hard in school. He obeyed the law. He raised a family. He took care of his family. He was an excellent student. He was on the Harvard Law Review. He did everything. He went through the democratic process. He didn't go out and make a lot of money on Wall Street. He gave himself to his community. This guy is almost pluperfect and they don't like him. WALSH: He is the American dream. He lived it, he embodies it, and somehow he did something wrong, I don't know what it is, but it is a little to do with the color of his skin. MATTHEWS: He didn't show up at Glenn Beck's House of Love, or whatever it is. BOB SHRUM: They might have made him sit in the back row. 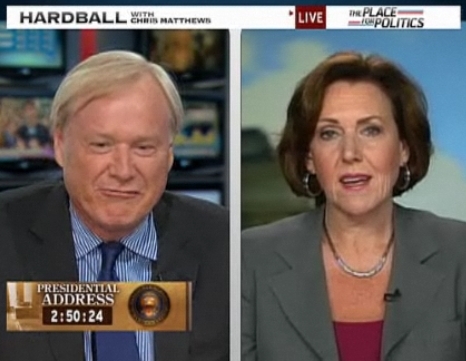 Did you hear Matthews almost panting when Walsh called Obama the American dream? Makes you wonder if studio assistants had to come in and give him a sponge-bath during the commercial break.